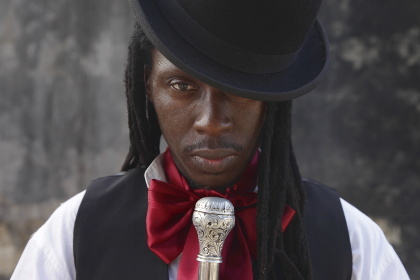 Bowler hat perched on dreadlocks, white shirt, black cane; Senegalese street-dandy style icon Faada Freddy steps out elegantly on his Gospel Journey. That’s the title of his first album, a collection of songs across different territories from soul to gospel, R&B to rock, Afro-Cuban to hip-hop, all seamlessly integrated under the banner of Faada’s warm, soulful voice. In fact, Faada’s several voices: the journey is a capella, just voices, singing, rapping, beatboxing and imitated instruments, accompanied by hand-clapping and body percussion. 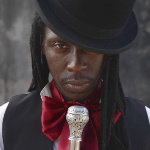 Faada was born in 1975 in Saint-Louis, Senegal and began his musical career there in the nineties as part of hip-hop trio, Daara J, who gained international acclaim with their 2003 album, Boomerang. He continues their positive activist philosophy and eclectic mix of musical styles on his journey, bringing messages of hope with sincerity and style.